Students are encouraged to collect real, meaningful data, organize that data and analyze the data to draw conclusions and explain what they have learned. There are many opportunities to incorporate data collection experiences within the school day. Capitalize on student interest by creating a daily data collection activity. Mrs. Soranno's kindergarten students move their name to answer the question of the day. Evidently the class is evenly split on whether or not they like mustard. Use a variety of data organization tools: tally chart, Venn Diagram, clothespin graph, bar graph, pictograph, etc. to help students learn to organize and interpret data in these different representations. Teachers of older students sometimes assign students the job of creating the question of the day and reporting the results to the class. Write each student's name on a clothespin. 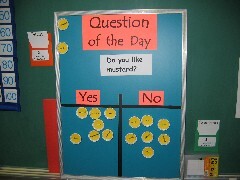 A piece of foam core board or laminated oak tag makes a great two-choice (Yes/No) graph board. 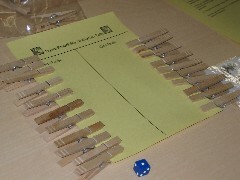 Students simply affix the clothespin to the correct side to indicate their response. Students can easily "see" the results and count to verify the outcome. Literature: Which character do you like best? What do you think the character will do next? Which version of the story do you prefer? Daily Routines: Are you buying lunch or did you bring lunch? Present or Absent? Ask students to report the results of who won two-player games so that the class can analyze the fairness of the games. These are great math center activities. See Heads & Tails Game for an easy two-player application that focuses on the probability of a single-coin toss. Use a clothespin graph or a simple tally chart to record winners (heads or tails) for class discussion of the data collection results. Data Analysis Investigations presents a collection of real-life data analysis activities. See Data Analysis 2 for more data analysis activities including Count in a Minute and Heads-Tails. See Data Analysis & Probability for additional dice toss and coin flipping data collection activities. 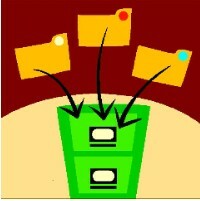 See Mathwire Archives for past issues of What's New on Mathwire.com and for past month's featured articles.